I want to burn fat…and sugar…and calories… and… why heart rate matters…? Once upon a time, an acquaintance of mine, Ze, wrote great article on the science of calorie burning. Actually he wrote a whole blog on calorie burning. Mad props to Ze for this. I am going to try and sum up Ze’s very scientific blog while incorporating some other sources, especially regarding heart rate. Note: There will be some generalizing here and there are exceptions. If you want to go all medical school on me, go for it. I’m just trying to get y’all started on this idea. Everyone’s heart beats. At least unless they’re dead. HA! Ok, bad jokes aside… Everyone has a Maximum heart rate. This is determined by 220 – your age. I’m 31… so my MHR is 220 – 31 = 189. Easy so far, right? The harder you work out, the faster your heart beats. Makes sense. Now some really smart people found that there are zones that reflect your heart rate and activity. 60-70% of MHR = The Energy Efficient/Recovery Zone. This is where the body is working at lighter aerobic level. Fat is pretty much being burned completely here. No glycogen burning. 70-80% of MHR = The Aerobic Zone. Just like the Energy Efficient Zone, you’re burning all fat. However, you’re now using your cardiovascular system, which will allow you to hike longer and longer the more you exercise your cardio. Scientifically speaking, you’re transporting a ton of oxygen/carbon dioxide here. 80-90% of MHR = The Anaerobic Zone. Here, you’re changing systems. Instead of utilizing your cardio system and transporting tons of oxygen, you’re using some oxygen but also engaging your lactic acid system by using stored glycogen in your muscles. You’re still burning fat, but you’re also burning glycogen and carbohydrates. Exercising in this zone will push you to your Anaerobic Threshold (AT), which is where you may experience “bonking” and failure. This is where using electrolyte foods/drinks will pay off. 90-100% of MHR = The Red Line Zone. This is a zone where you primarily use glycogen (hardly if any fat) for fuel. It is very difficult to engage in this zone for a long amount of time and, therefore, this is used more for interval training/HIIT or quick bursts (a quick run to a steep summit). Very fit people often train in this zone. This is where I want you to pay attention. As Ze empirically points out, calorie burning IS NOT LINEAR to work output. This article also does a good job of explaining this concept. Basically, if you’re in your aerobic zone, you’re burning all fat. However, if you’re in the anaerobic zone, you’re burning a ratio of glycogen/fat, but burning a whole ton more calories…and therefore more fat. This is the big idea to get across. If you want to burn fat, you want to get yourself into that anaerobic zone sometimes… but because of lactic acid build-up/AT, you will not be able to sustain this pace for prolonged periods. Therefore you will want to also utilize your aerobic zone to burn additional calories and fat. We can conclude that slow and steady wins the race. If you hike too quickly (anaerobic/red line) and use up your glycogen, you will bonk early on. 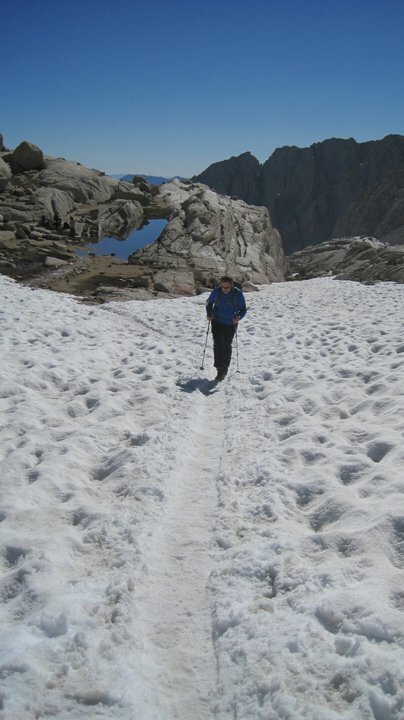 However, if you remain in your aerobic zone for much of your hike, you conserve your energy and hike for a heck of a lot longer and go farther. If you’re a slow hiker, though, don’t worry! The stronger you get and the lighter you get, the more efficient your heart and body will become, resulting in a faster aerobic pace. I’d also recommend buying a heart rate monitor. There are several that work well. Make sure you get one with a chest strap. Polar and Garmin are my two brands of choice. I personally use a Garmin 310XT GPS/HRM that I love. I’ve also used a Garmin FR60 (now 70) that also worked really well. These will tell you what zone you’re in, what % MHR you’re at, and they will even audibly guide you to be in whatever target zone you set. It’s a very worthy investment. 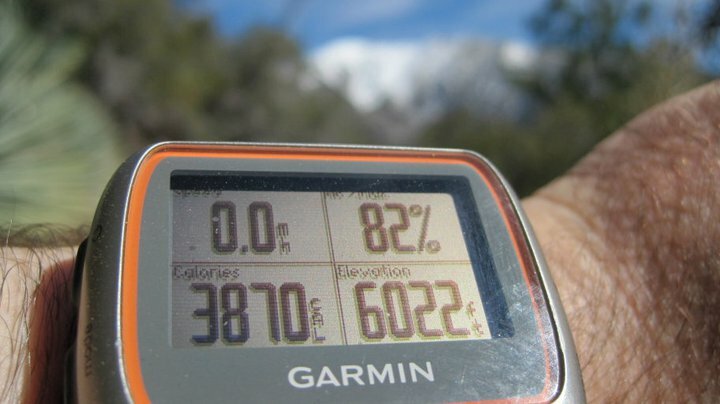 Posted on July 1, 2012, in hiking and tagged 310xt, aerobic, anaerobic, calories, fat, fr60, fr70, garmin, heart rate, heart rate zones, hiking science, nutrition, polar, recovery, red line zone, speed. Bookmark the permalink. 5 Comments. I have HRM by CardioSport called the Limit Plus – Will this do? hey! i don’t know that brand well but when i googled it, it seemed pretty good. i’d just recommend one that has a chest strap. otherwise, if it takes your pulse from your wrist, it might not be the most accurate.